But Rosenfeld’s arrest is the first time that a would-be terrorist was espousing ideas I had specifically touted in print. My 1979 article on “the failure of the All-Volunteer Congress” concluded: “Our national interest can only be served by a balanced section of people from all parts of society.” But that piece was a satire that the New York Times published political eons ago. I haven’t tub-thumped for that doctrine since then though I have sought to help Congress gets the respect it deserves. But setting off 200 pound bombs on the National Mall is a very bad idea regardless of congressional perfidy. WHY NOT DRAFT THE NEXT CONGRESS? The All-Volunteer Congress has proved to be a failure. Its cost is extremely high and there is not a proportional representation of minorities. There are also many doubts about the honesty and intelligence of the recent volunteers. Many of Congress’s recent failures are owing the low quality of its composition. A change is needed .The country can no longer afford the high costs of the volunteer system, nor can it tolerate the low level of performance and reliability. Conscription appears to be the only way to get a decent Congress at an affordable price. The current Congressional system has demonstrated its inability to deal with crises. The energy crisis has been endangering our economy and national security since 1973, yet Congress has been incapable of launching a coherent and effective counteroffensive. Any system that fails like this cannot continue except to the detriment of the nation. With national security problems, inflation, and the specter of a recession, we cannot afford the luxury of a mercenary set of lawmakers. No one has been willing to defend the intelligence of the current set of volunteers. The fact that this group has not been able to balance its income and expenditures for 10 years straight shows a marked deficiency. In a society with 50 percent women and over 10 percent black and Hispanic populations, these groups are very underrepresented in Congress. When we consider the injustice of these statistics, superficial objections against conscription are easily swept away. A viable democracy needs to have a racially, sexually balanced set of representatives. The latest statistics issued last November proved that this lack of representation is worsening. It is only the ego-starved who volunteer for Congressional duty now. These people are forced into Congress by their psychological or mental poverty, as no real alternative or treatment exists for their condition. Naturally, Congress is psychologically off-balance, because of the nature of the people who currently volunteer. Most of the members of Congress are between 30 and 60 years of age. There is no group that enjoys the benefits of society more than this group. They have the highest salaries, the nicest homes, the largest cars, and the most power. However, this group is deeply entrenched in hedonism, and has thus far turned a deaf ear to the needs of the country. Something is needed to restore the sense of honor, duty, service, and patriotism to the middle-aged. With a service-oriented Congress, everyman and woman would be required to register with the Selective Service Commission on their 30th birthday. Every second year, everyone’s name would be placed in a giant basket, and the Secretary of Labor would pull out the number of names needed for that session of Congress. The new members would receive a subsistence allowance (an honorable precedent established during the Revolutionary War), as it would not be right to overpay someone for what he owed to society. The moral caliber of Congress would be improved by conscription. The environmental and personal background of many of today’s volunteers appears to be conducive to fabrication. Randomly picking people off the street would give a much higher level of honesty and responsibility. Some people object to the idea of conscription in itself. But, rather than being a moral evil, Congressional conscription should be seen as giving an opportunity for service to the middle-aged. The draftees would have the chance to serve their country and be a part of an important process, and would also learn a lot in the process. The educational benefits alone could justify Congressional conscription, as it is well known that many middle-aged people lack intellectual stimulation or the opportunity to increase their knowledge. Granted, it would be easy to just let the system go on as it is, hoping that it doesn’t totally break down tomorrow. But, can we allow our national interest to be determined by an overpaid, racially unbalanced, and psychologically unstable pack of volunteers? Our national interest can only be served by a balanced section of people from all parts of society. 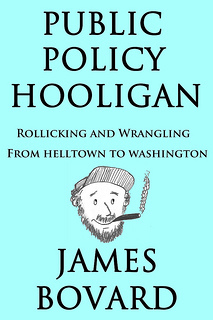 TAGLINE: James Bovard is a writer currently in exile in the Appalachian Mountains.